We love our clients! Hear what they have to say… we are adding more reviews all the time! if you are a current or past client, we’d love to hear your thoughts on our services. 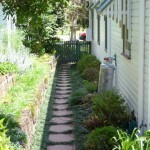 I discovered Paul through a local motel owner that I thought always had a spectacular garden. As one of my properties that I manage was directly across the road from the motel I was distressed that my garden was not doing anywhere near as well. Being built on a beachfront sandhill we had always had a nutritional problem, a problem with salt spray and an inability to hold moisture so we were getting desparate. Here we had a multi million dollar beachfront holiday property with an “average” garden. Paul has now been tending the garden once a month for 4 hours over the past 6 months just to nurture the garden along. The results has been spectacular with some new plants, existing ones relocated to more suitable positions in the garden and the irrigation system redesigned. The Garden for the first time ever is looking healthy happy and growing in leaps and bounds. I look forward to our first spring and summer and seeing the garden reaching its full potential. 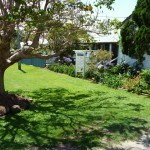 Paul has been a life saver and has given this holiday rental property its first WOW season in the garden. Paul Mundweil is just a really nice ordinary sort of bloke, the type of bloke everyone likes. 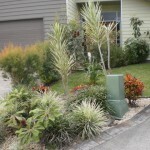 Paul has done a great job taking care of the gardening needs of my five investment properties in Sallywattle Drive Suffolk Park Byron Bay for the last three years. Paul has taken care of my gardening needs for three years now. This has given me free time to get on with other projects as I used to do it myself. I actually love gardening, like Paul. Paul is the only person I can trust to do a good job! Paul does much more than maintain the Buffalo grass in superb condition throughout the year with various levels of cutting depending on the season. The weeds are kept down with the selective herbicide NUTRASENE. Also there are special fertilisers with selected NPK rates that only a qualified horticulturist understands. This is why my properties stand out….the result of special efforts by Paul Mundweil. When Paul Mundweil mows the grass ends up looking like carpet! I have supplied a couple of photos to add to the website. Paul has the necessary equipment and is highly skilled in pruning and shaping hedges and shrubs with secateurs, hand hedge trimmers and power equipment where necessary. 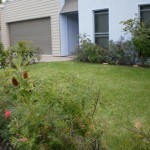 Paul pays special attention to the needs of tenants, pets and gates and any special instructions. Paul follows instructions given by the Lessor and reports on Tenant needs and seems to keep everyone happy with his friendly hard working manner. On completion the job is always left clean and tidy with the use a petrol powered leafblower. Paul Mundweil has been working with me for almost six years. In that time he has created two very special gardens from nothing but rock, dirt and weeds. He has such a good horticultural knowledge that the planning, planting and pruning can be left to his care. He knows which plants will grow in the sun and which plants grow in the shade. Quite simply he knows and cares about the plants and the soil. He has been responsible for organizing paving areas and, in my first garden, he built the most beautiful dry stone wall which looked perfect in its natural environment. 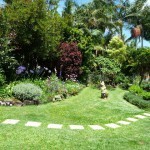 Paul can plan, create and maintain a luscious lawn in your back or front garden. If you want someone to sort your garden needs, Paul is the one to choose…reliable and reasonable too. I’ve used Paul’s services for the last 5 years at my house for general gardening and maintenance, some paving, tree pruning, and a variety of other services to make my back and front yard pretty close to the best in the street. Working from home its very important to me to be able to walk out into my backyard and relax, and Paul certainly assists on an ongoing basis to make sure my backyard is a peaceful spot where i can get away from it all. Wouldn’t hesitate to recommend, very reliable, knowledgeable and all at a reasonable cost.